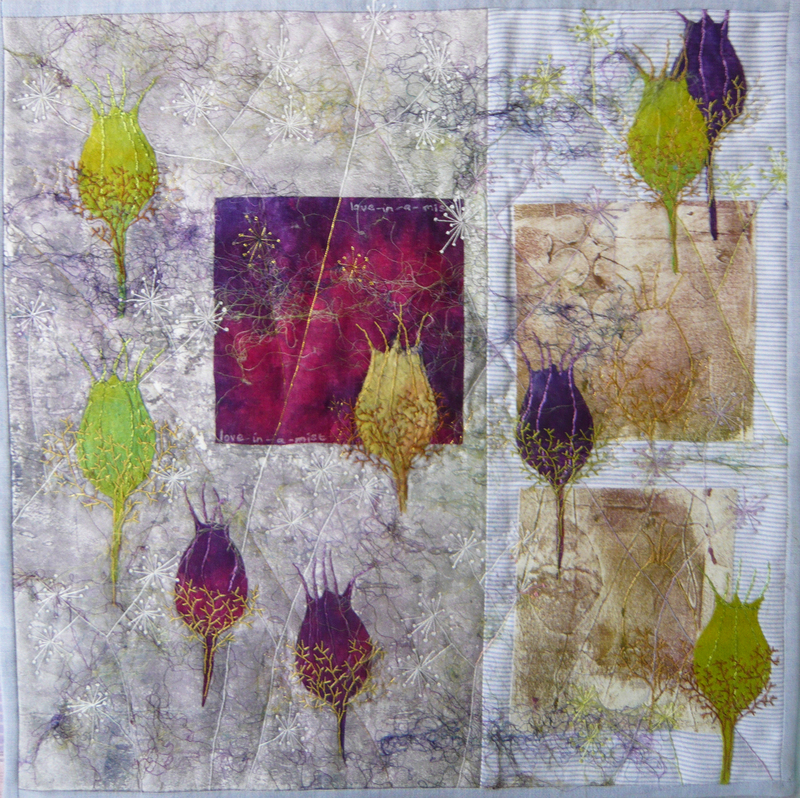 My inspiration for this piece was the seed heads of Nigella, also known as Love-in-a-mist because of the wispy spikes that surround the seed heads. I wanted to show the seed head forms, but I also wanted to create a misty feeling to the background (as a nod to the common name of the plant). I used Bondaweb painted with diluted acrylic paint then fused to white cotton on the left hand side of the piece, and contrasted it with soft commercial cotton on the right. 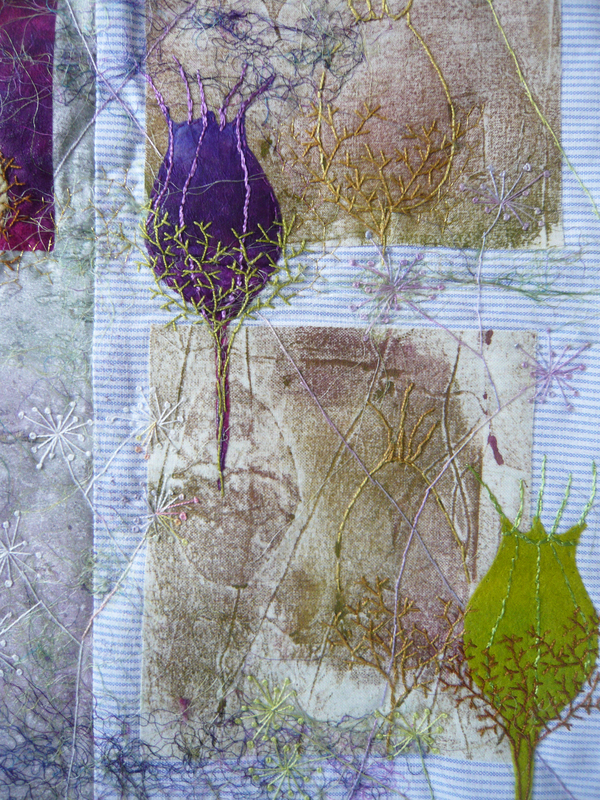 I added purple Tissuetex to the Bondaweb, and I experimented with collograph printing of the seed head shapes to give me the square pieces for the right side. 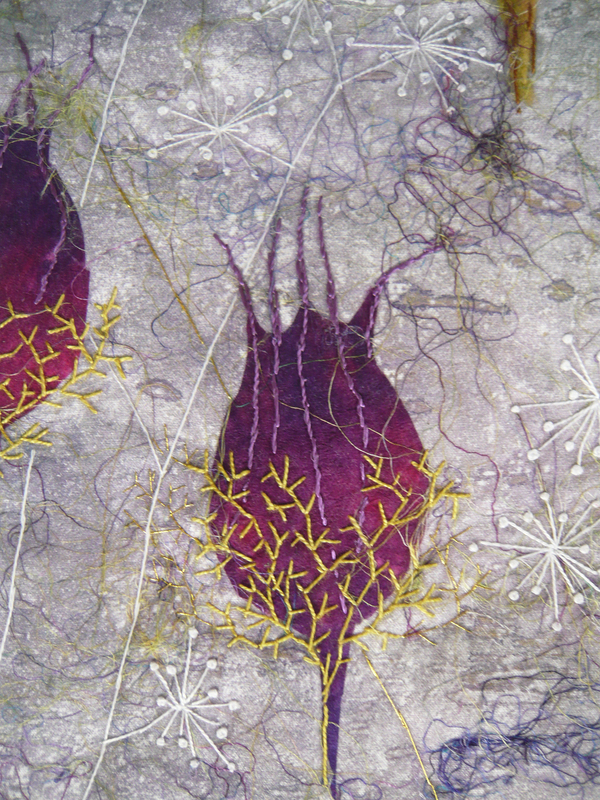 The green seed heads are made from dyed felt, and the purple ones are more Tissuetex. 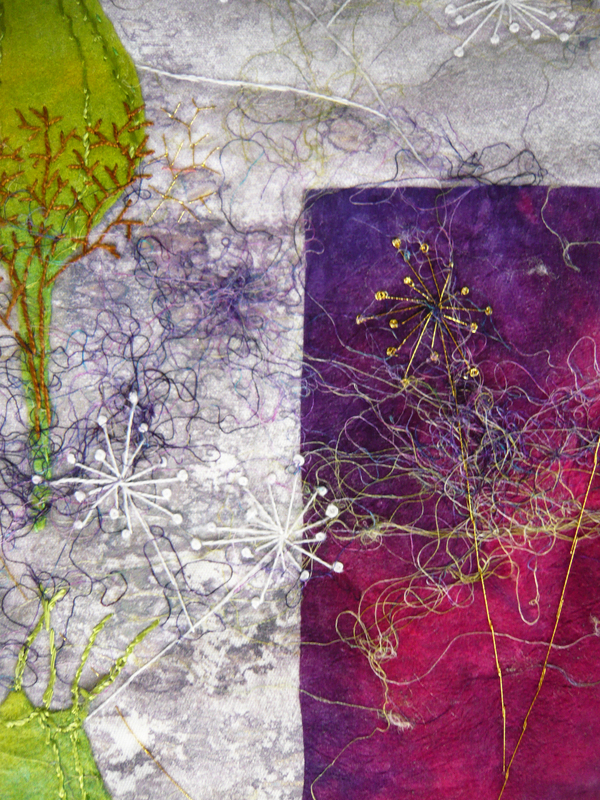 To create the wispy effect, I added strands of dyed merino wool and silk. Because the painted Bondaweb retains some of its ‘gluey’ property, it was possible to bond the various elements directly to the left side, while I used MistyFuse on the right side to attach all elements. 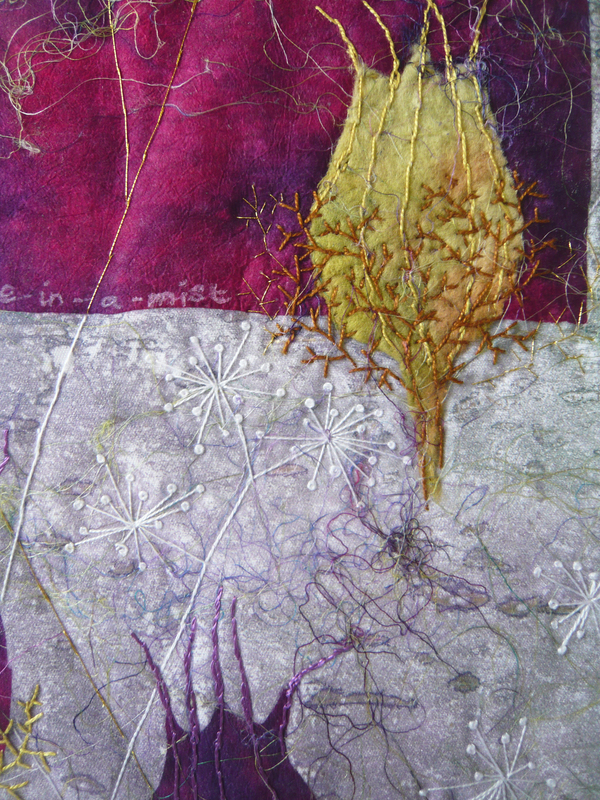 The veins and the spiky parts of the seed heads were hand-stitched, and I also added hand-stitched seed heads of sweet cicely (which is one of the motifs that I am using through my series). The hand-stitching gives detail to the piece and acts as the quilting stitches. Finally I wrote the common name of the plant in white ink on the dark Tissuetex. Joan this piece is so delicate ! I love your choice of colours and I love your embroideries.Your three quilts together are just so beautiful … bravo ! I can’t wait for the next one ! Joan you are going from strength to strength, this is simply stunning, I love your attention to detail. Wow, love all those techniques, it has created such an interesting quilt. Well done. This is beautiful and dainty. I love how you have constructed the different elements and the soft colour palette. The embroidery really enhances the overall effect. What a beautiful third piece in your series. I love all the different surface techniques you have been using. The use of complementary colors is beautiful as is your hand stitching. Well done! Again a stunning piece, Joan. You did create the misty feeling you wanted. Lovely details and techniques. A lovely piece, the stitching certainly creates the misty feeling as does the background fabric. With the different surface techniques and embroidery you used, you created a misty field feeling for the delicate nigella. Just lovely.